Authors: Motta, S., Cole, M.
Motta and Cole explore the role of the politics of knowledge and pedagogy in the reinvention of socialism for the twenty-first century. Through a critical analysis of Brazil, Colombia and Venezuela they deconstruct the mechanisms of neoliberal control as an epistemological project of monologue, closure, and violence against all ‘others’. 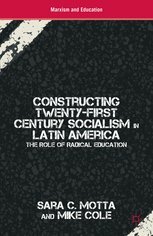 The authors develop an affirmative engagement with the traditions, practices, and politics which seek to challenge this closure through the policies of the counter-hegemonic government of Venezuela, the struggles of social movements in Brazil and Colombia, and the daily resistance of critical educators working in formal educational settings in all three countries. This mapping and analysis not only contribute to struggles for alternatives to capitalism in Latin America, but are translatable to other contexts.